No, I am not going to go on a rant about Michael Phelps! As a matter of fact, I didn't even really watch a lot of the Olympics at all. And so it's been said, those Chinese girls were NOT 16 years old. No way, no how! Don't get me wrong, I'm happy for those who acheived their goals and took home medals. Not just the Americans, but all of the contestants who set their sights on something and pushed themselves for it. And I think it's great that Michael Phelps won 8 gold medals. But for me, that's where it ends. I don't need to talk about it all day at work. And I certainly don't need to buy Michael Phelps T-Shirts from QVC for $19. 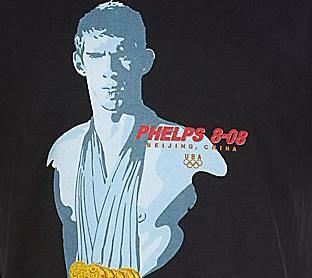 Yes, they are selling T-Shirts to commemorate his 8 gold medals. Only trouble is, it's an "artist's rendering" of Phelps and not an actual photograph, which makes me wonder... Why couldn't they get a photograph of him? It's not like he hasn't been seen anywhere lately. Oh wait, they're not *allowed* to use a real photograph because these aren't 'official Olympic' shirts, they're just shirts that QVC had printed with his name on it. Welcome to America, where people will truly buy anything! And a new Periodic Table Element has been discovered. Like This Site? Know somebody else who might? Please click the link to recommend us!